Performacide® Hard Surface Disinfectant is for use on hard, non-porous surfaces as a disinfectant, sanitizer, tuberculocide, virucide, fungicide, algaecide, slimicide and deodorizer. 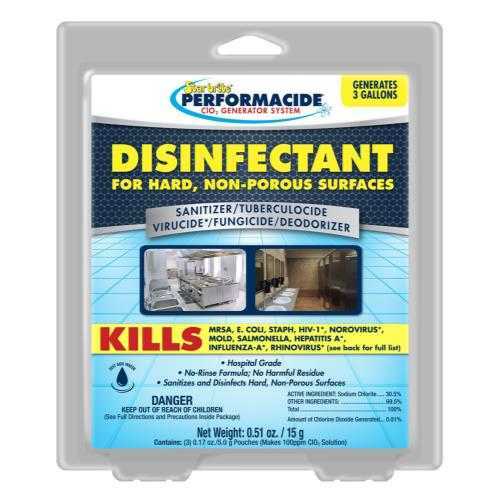 Performacide® Hard Surface Disinfectant utilizes Chlorine Dioxide (ClO2) that is generated by adding a sealed pouch to a pre-determined amount of water that creates a 100 ppm solution. The solution can then be diluted for use as a sanitizer on both food contact surfaces and non-food contact surfaces.